Ida Kate Duer, daughter of Harry Duer and Isabelle McNeil, was born Jan. 2, 1881 near Monmouth, Warren Co., Illinois and died Jan. 12, 1962 in Corning, Adams Co., Iowa. She married John Henry Hess Jan. 2, 1961 in Taylor Co., Iowa. 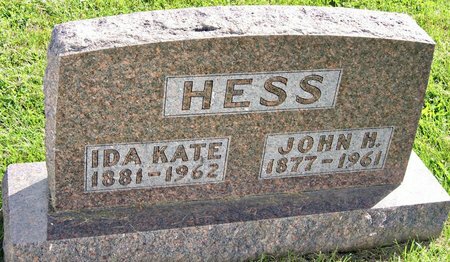 He was born Feb. 26, 1877 in Taylor Co., Iowa, son of Londona Hess and Henrietta Hart, and died April 22, 1961 in Villisca, Montgomery Co., Iowa. Searching for JOHN HENRY HESS in Taylor County Iowa?